MasterCard defends the political establishment by blocking WikiLeaks. Monday, MasterCard let it be known that it wants to tell us where our money can go. The world's number two credit card company has decided to prevent anyone from using MasterCard to donate to WikiLeaks. As I discussed in the previous post, this decision was justified by a totally unsubstantiated assertion (that WikiLeaks had done something illegal). I explained that such moves could seriously impede WikiLeaks' ability to defend itself, should governments take WikiLeaks to court. But MasterCard's action Monday was also an attack on you and me; it was a cynical assault on our free speech rights. The level of hypocrisy here is breathtaking. I did some digging around and discovered that MasterCard has pet causes of its own, highly political "projects" that are no less controversial than WikiLeaks. For favorable legislation, there's MasterCard. According to Open Secrets, between 1998 and 2009 MasterCard spent about $20 million dollars exercising free speech, funding a small army of lobbyists. This spending came at a cost to society. By 2009, largely as a result of lobbying by MasterCard and the banks, Americans had very few rights as credit card holders, as financial consumers. The financial crisis that had broken out the previous year could largely be attributed to lobbying by financial institutions such as MasterCard. A milestone along the path to financial catastrophe had been the repeal in 1999 of the Glass-Steagall Act of 1933 (which had been enacted to prevent another depression). The passage of the repeal bill had been anticipated by a record year of lobbying by MasterCard. This year in a landmark ruling, the US Supreme Court affirmed that all Americans -- people and so-called corporate persons -- have the right to free speech. The court ruled that the act of donating money to a political cause qualifies as protected free speech under the First Amendment. 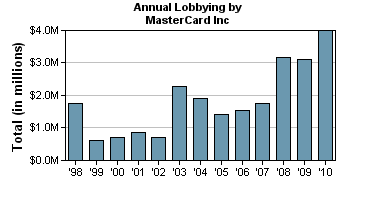 In 2010 MasterCard, already one of the top spenders on lobbyists, increased its donations to lobbyists by 25%. So far this year, MasterCard has spent almost $4 million ($3,990,000.00 to be exact) lobbying Congress. Moreover, this year banking lobbyists filed more reports of lobbying activity for MasterCard than for any other financial institution. Mr. Selander, 59, is retiring from MasterCard with a pile of cash. He took home more than $149 million over the last nine years in salary, bonuses and stock he cashed out, according to an analysis of corporate filings conducted by Equilar, a compensation research business. He also has a pension worth $3.7 million and an additional $33.3 million in stock and options. Selander still sits on the board. In April 2010, Ajay Banga became MasterCard's new CEO. The previous year, when Americans were losing jobs in vast numbers and houses were being shuttered, Banga had brought home $13.5 million working for Citygroup. This payment included "a large sign-on bonus" and a stock award to make up for compensation he was "giving up" by leaving Citigroup. As you may know, over the course of the financial crisis, Citygroup, Banga's former employer, received $45 billion in TARP bail-out funds (a gift from America's political establishment to the banks, paid for by taxpayers). So far during Banga's short tenure as CEO of MasterCard, the company has jacked-up MaserCard's lobbying efforts by at least 25%, whilst banning cardholders from donating to WikiLeaks. This much is certain: Banga heads a corporation that sees fit to spend freely on the political causes it favors, whilst restricting the ability of citizens to use their own money to have a voice. First the banks took our money, now they've come for our liberty. Modern technology has allowed the creation of an efficient electronic payments system. It should cost almost nothing to transfer money from an individual’s bank account to the merchant’s bank account when a purchase is made. Yet the credit card companies charge large fees, as much as .6% to 2.4%.20 These fees act as a tax on every transaction, but a tax that goes not to public purpose but to enrich the coffers of the credit card companies, largely the banks. Other countries have curtailed the anti-competitive practices; but given the need for deficit reduction, an alternative is to redirect the revenues for public purpose, by, for example, setting the fees at 1.5%, with say 50 basis points going to the card companies, and the rest dedicated to deficit reduction. This is an example of an efficiency enhancing deficit reducing reform—consumers and merchants would be be!er off, transactions costs would be lowered, and so to would the deficit. Nine pages pdf. Professor Stiglitz at New Deal 2.0 is a lucid thinker summarizing several good alternatives to the earned income tax. This kind of thinking scares the crap out of credit card companies. They will resort to anything to avert developments like this. I am seriously contemplating refusing to clear my credit card bills till Mastercard explains its illegal actions. What would happen if we moved this as a form of protest? Apparently, money seems to be the only language that's getting through across the two sides of this transparency divide. 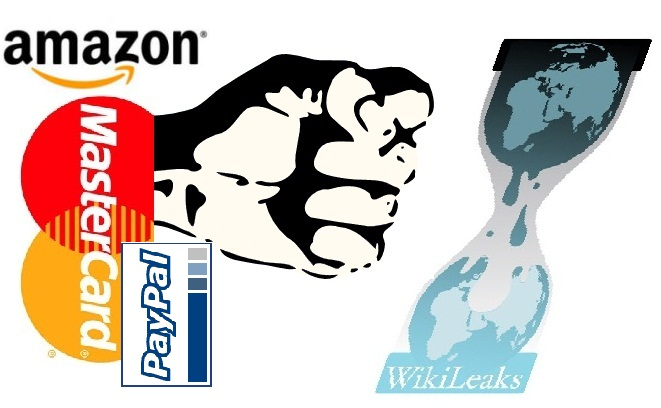 With Visa on board, the financial industry has now lined-up against WikiLeaks. I think an effective protest will be very difficult as it could not depend on the media. The best outcome might be if it encourages a critical mass to turn to alternative avenues of commerce. John's idea (above) I find very appealing, but how to move it along? Credit goes to Professor Stiglitz. An even better idea (which will be met with all the opposition Wall Street can muster) is a per-share transaction tax on stock trading. Check out the link. Something as small as a fraction of a penny would never me missed and the sheer volume of trading could become a great revenue stream for the Treasury. But here again is another painless, reasonable idea that will be killed by lobbyists.